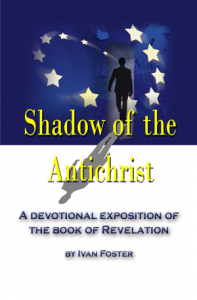 Shadow of the Antichrist book available to read or download in PDF format. Printed copies of the book can still be had from The Sovereign Grace Advent Testimony book room. It may also be ordered by email from its Secretary (click here). This online pdf edition (4 mb) is for the convenience of those who wish to study prophecy and it may be freely downloaded. Email Rev. Foster with your name and street address to order a copy. God has a lot to say about the nations that were in the old Roman Empire; and in 2012 a series of meetings were held considering many such countries, so that particular thought should be given to what the Bible tells us of the future. This booklet has been added to that series of messages. The reason why the Lord has told us so much is because He would have us to understand His purpose for the earth. people to have visited this site! Click here to see statistics on recent site visitors. As of 30th May, 2017, I have requested that SermonAudio close my account. That has taken place and I no longer mount sermons there. Instead, my own website The Burning Bush will now house all my sermons. It has long been the home of my articles and news links. Gradually we will mount the 1376 messages I had on SermonAudio on my own site. The papal visit: Why we oppose it. A booklet explaining our opposition to the state visit of the Pope to Great Britain. Click on the link to read or download and print. Ignoring sin...no basis for blessing. A plea to Free Presbyterians. The Union with today’s Great Britain holds out no hope for the Ulster Protestant. Written at the request of the Belfast Newsletter and published in its edition of August 13th 2010. Why should Martin McGuinness as First Minister alarm those who told us all that Sinn Fein had radically changed and was ready for Government? which has settled into many a Free Presbyterian heart. The Ulster crisis 2006-2008 An account, given at the recent Congress of Fundamentalists at Foundations Bible College, of the distress felt amongst believers in Ulster during the controversy aroused by the decision of Dr Paisley and the DUP in 2006 to enter a power-sharing government with Sinn Fein/IRA, a party which openly condoned murder and terrorism. A timely consideration for God's people in the light of more recent revelations in the political realm! The gospel is no longer enough - a timely article by Rev Andy Foster on a dangerous folly embraced by all too many fundamentalist ministers. Lesson learned from 30 years in Christian education. The substance of an address given at the 2010 Annual Education Board Dinner in Lisburn, Friday 28th May, in the presence of Education Board members, teaching staff of the Free Presbyterian Christian schools and their spouses. A message from a quarter of a century ago...which sheds light on our present circumstances. Christian Schools And The Future Of Free Presbyterianism. A message preached by Rev. Ivan Foster at the 2nd Seminar on Christian Education, held in Martyrs Memorial Church, Belfast, as part of the annual Easter Convention March 29th, 1986.